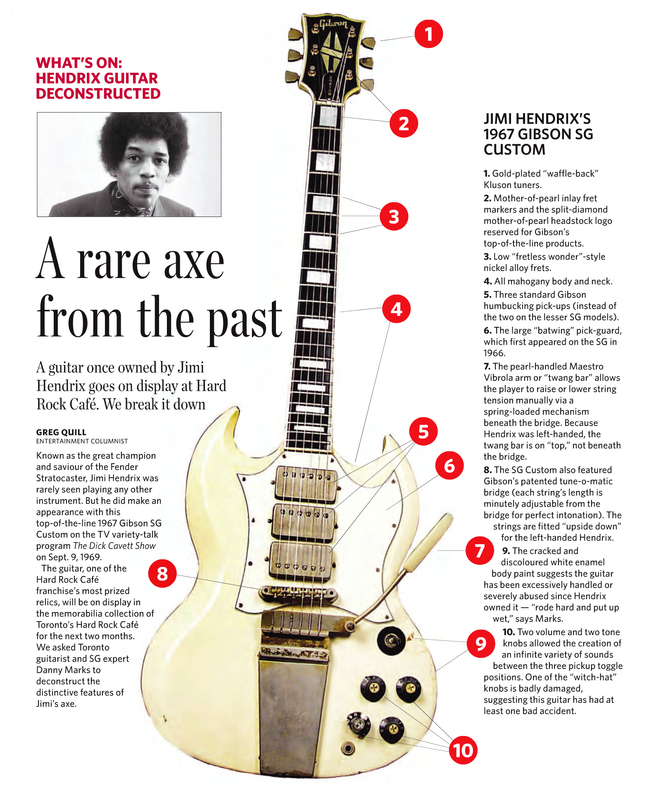 A very well known and documented guitar with the most incredible provenance that has etched its mark on the eternal pages of rock ‘n’ roll history, most notably with the Rolling Stones and Eric Clapton. The guitar is an original 1959 Les Paul Standard that was purchased new in March 1961 from Farmers Music Store in Luton, United Kingdom, by John Bowen. John played with Mike Dean & the Kinsmen and he had a Bigsby Vibrato fitted at Selmer’s in London before trading the guitar in there for a Gretsch Country Gentleman in late 1962. The guitar was later purchased by Keith Richards, who was playing guitar in a little known outfit called the Rolling Stones. 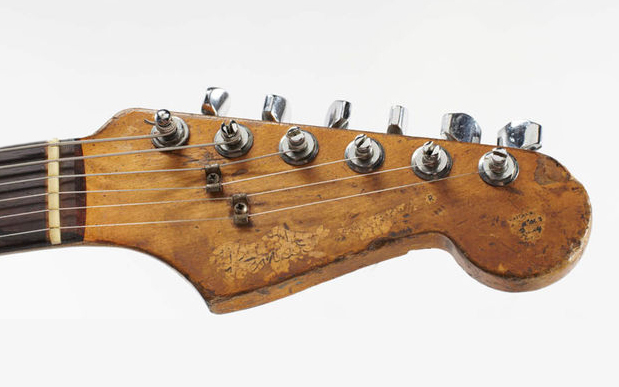 Keith Richards used this guitar extensively in the early days of the Rolling Stones and it was seen regularly from autumn 1964 until 1966 when Keith began to favour a Les Paul Custom. 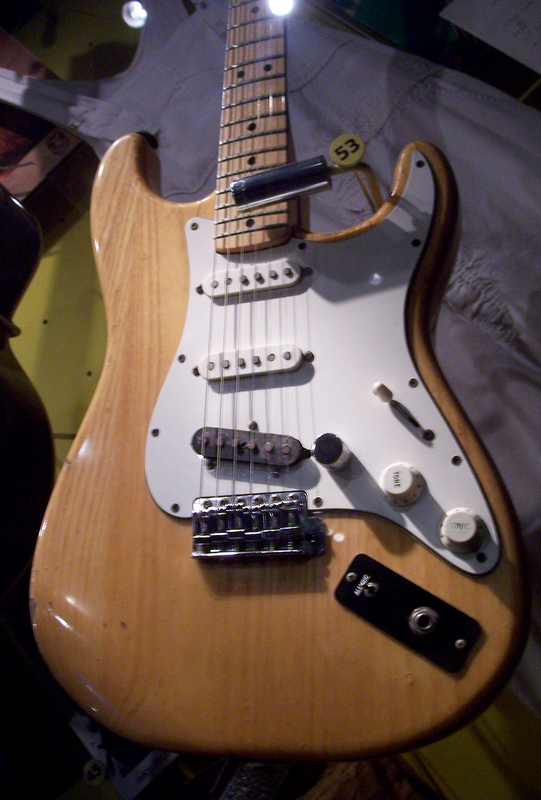 Appearances on ‘Ready Steady Go’ and classic songs like ‘The Last Time’ and ‘Satisfaction’ have been played on this guitar. There are many great photographs of Keith and the guitar. Keith was the first major rock star to use a ‘Burst’; he was probably partly responsible for inspiring both Clapton and Page to pick up Les Pauls. Keith owned and used a Les Paul Standard way before Clapton had one, before Jeff Beck, before Peter Green, before Jimmy Page, Mike Bloomfield, Joe Walsh, Billy Gibbons, Duane Allman etc. (need we go on?). Keith sold the guitar to Mick Taylor in 1967 when Taylor had replaced Peter Green (who in turn had replaced Eric Clapton) in John Mayall & The Bluesbreakers. The Bluesbreakers’ classic British Blues sound was forged when Clapton plugged a ‘Burst’ into a Marshall JTM45 combo and Peter Green followed suit, later selling his ‘Burst’ to Gary Moore. Taylor had stood in for Clapton when he failed to show for a gig one night and ended up playing Clapton’s own Les Paul, so it was inevitable that the young Taylor would go for the same guitar and he exclusively played this Les Paul up to his joining The Rolling Stones two years later. Before Led Zeppelin, Jimmy Page was a red hot session musician who cut his teeth on a 3-pickup Les Paul Custom fitted with a Bigsby. 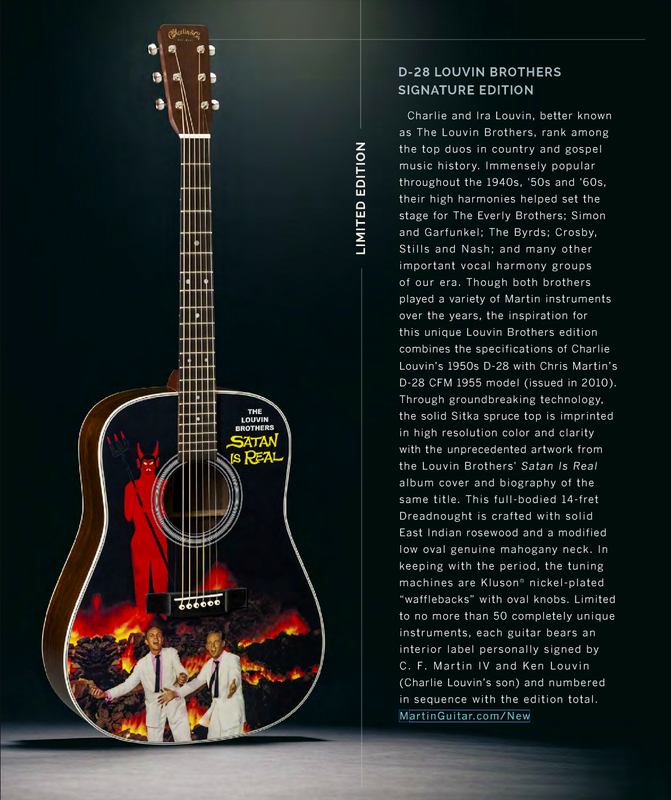 It is possible that Jimmy considered buying the ‘Keith Burst’ from Richards or maybe just used it in the studio? We aren’t entirely sure but we know that Jimmy used the guitar on at least one mid 60’s recording session. 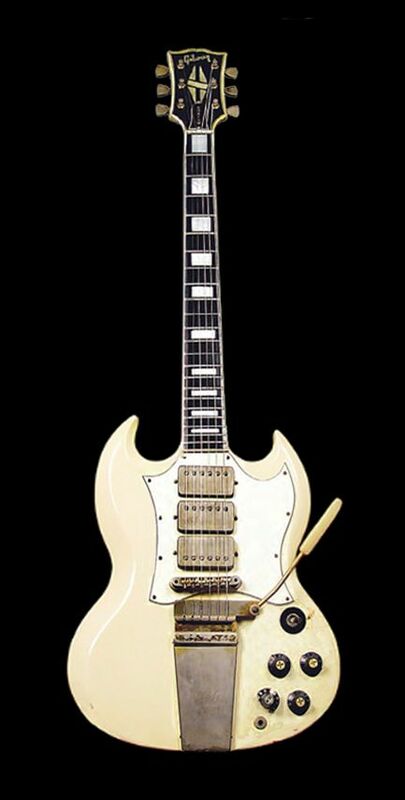 Eric Clapton used the ‘Keith Burst’ in 1966 with Cream at the Windsor Jazz & Blues Festival. There are several photographs of Clapton with this very guitar at the concert. Maybe Clapton borrowed it from Keith? 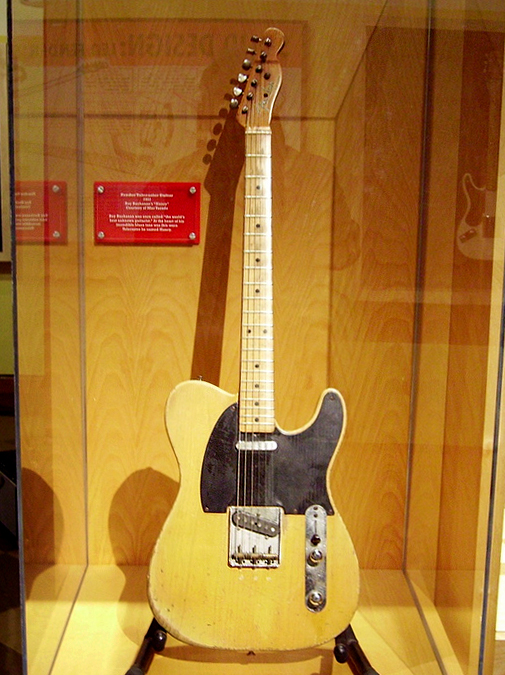 Roy Buchanan’s 1953 Fender Telecaster named “Nancy”. Taken from the Fender Exhibit. It must have been a fairly well lit exhibition since she looks so pale. Roy bought Nancy in 1969 from a guy that passed him in the street carrying the guitar. In 1960 Roy Buchanan replaced Fred Carter Jr. as guitarist in Ronnie Hawkins’ Hawks. After a short period, he left the Hawks and teenager Robbie Robertson took over the lead guitar. Buchanan, one of Robertson’s main guitar influences, also performed as an opening act for the reunited Band on their 1987 tour. Levon Helm mentions in his book, This Wheel’s on Fire – Levon Helm and the Story of The Band, that they thought Roy was an amazing guitar player but he was too weird to have in the band, hence they let Robbie take over once he had taken a few guitar lessons from Roy. 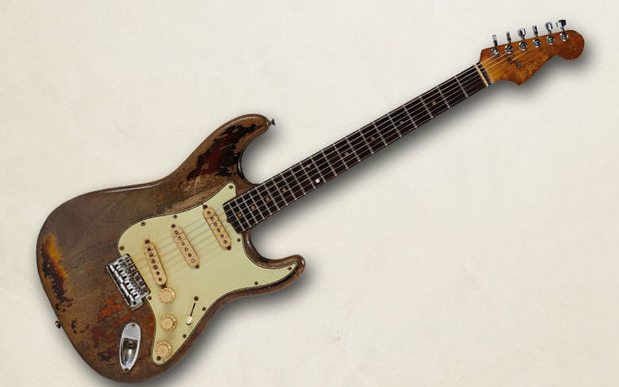 Stevie Ray’s Number One, also known as Vaughan’s ‘First Wife’, was a ’62/’63 Fender Stratocaster used by Vaughan for most of his career; it was “rebuilt more times than a custom Chevy.” Vaughan always claimed it was a 1959 model, since that date was written on the back of the pick-ups; Rene Martinez, who maintained the guitar since 1980, saw the year 1963 stamped in the body and 1962 on the neck. 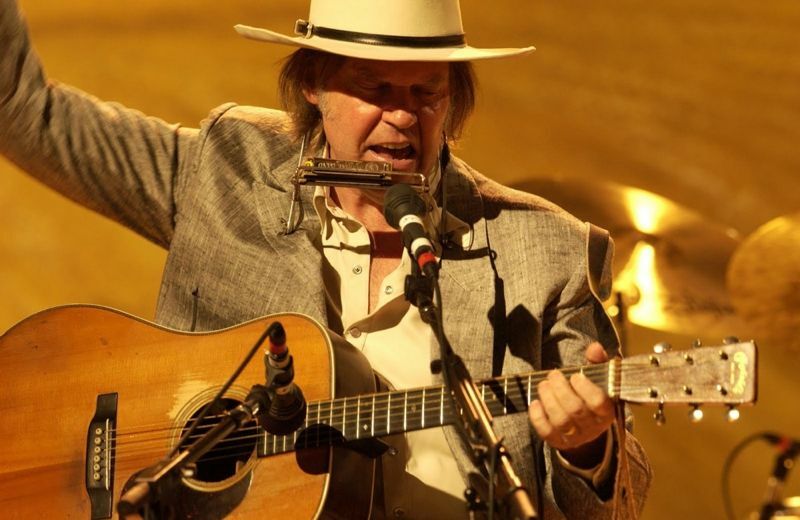 The guitar was given to him by the owner of Ray Henning’s Heart of Texas music shop in Austin, Texas in 1973, it was his main performing instrument and companion. 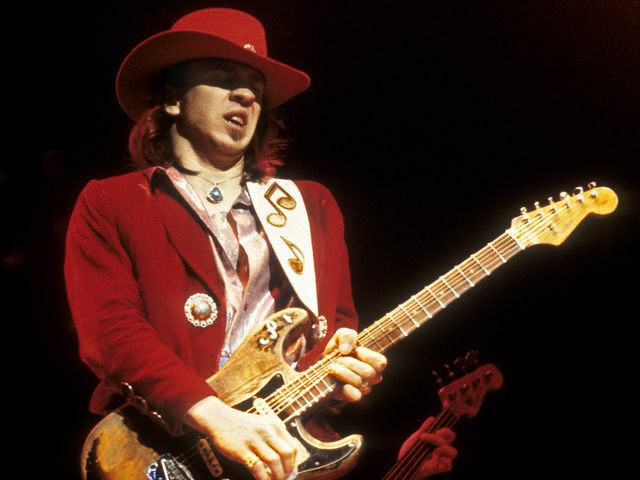 Although the original had a white pickguard and strangely hot ’59 pickups, Stevie replaced the pickguard with a pickguard featuring the now famous SRV lettering. Remarkably, Stevie had the frets replaced with jumbo bass style frets while he played on a reportedly .013 (going as high as .018) guage strings. Number One now resides with Stevie’s brother Jimmie. It’s been permanently retired in memory of Stevie. 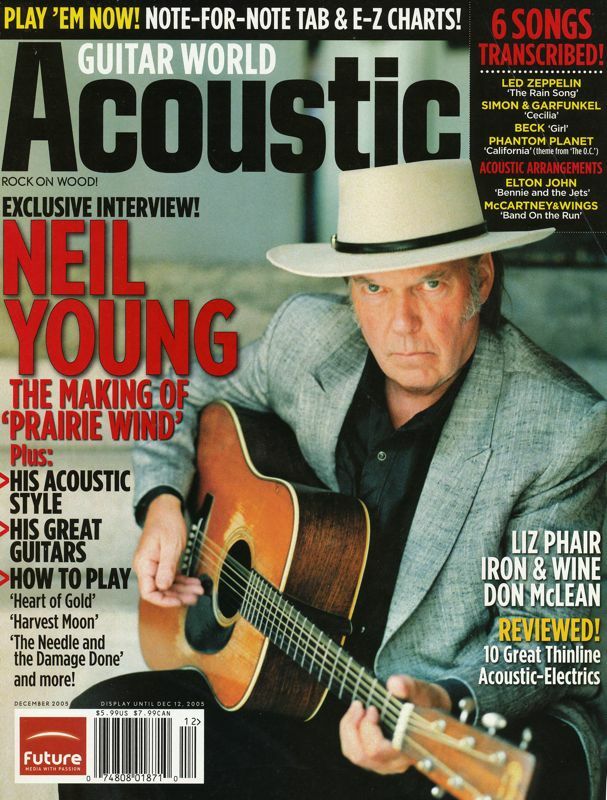 Here is an interview with Stevie’s guitar tech Rene Martinez. I love that he is smoking a pipe when he comes out on stage, a bit unexpected.